Some of the bad guys were a pain, these orange (then red, then blue) knights were amongst the worst. 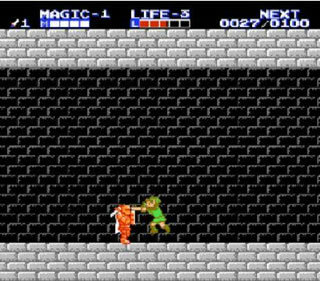 Often overlooked by many, The Legend of Zelda II – The Adventure of Link (hencefore “Zelda II”) is a fabulous game in it’s own right, and a worthy addition to the Zelda series, but why was it overlooked by many? More importantly – why should you play it? Well first a bit about the game, Zelda has not been kidnapped this time, but instead has been put into an eternal sleep, and it’s upto you to awaken her before Ganon is himself awaken and takes over the world. Nasty eh? The game – rather than being an overworld, top down adventure, instead is a side scrolling game – not really a platformer, more of a scrolling fighter with RPG elements. It’s tricky to define, but it’s definitely a “Zelda 2” game. Unlike the first one, the game is more spell orientated, with less objects (including no bow and arrow nor boomerang, mainstays of the first game & most other Zelda games). Each castle hides an object, and each town there is a mystical man with a spell for you to learn, though finding either is half the battle. These spells & items are needed to complete the game, though some items you will use only once. Furthermore, you can also level up your skills by killing monsters, an idea not usually portrayed in Zelda games, more akin to the Final Fantasy series. Anyway, the game itself does take a little bit of getting used to – the fact that your character’s sword and super sword (the beam weapon you get when you have full health) are both pretty pathetic (though you do have a up and a down thrust as well), and that monsters are a complete ballache to kill. 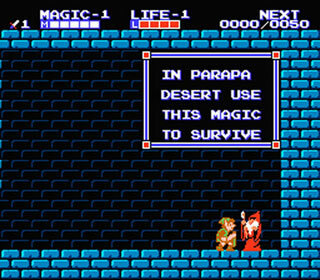 Those who are familiar with the original Zelda game may not take to this game, but give it time, as there’s a fascinating game underneath the surface. Yes, it’s as hard as hell, there’s a lot of times where you’ll tear your hair out, and you’ll hate swamps with a passion. However, there’s a huge amount of love for this game, and rightfully so. It’s remarkably addictive all things considered, and I’m not really sure why. It’s a fantastic side scrolling RPG, and has a lot of charm. I will make a special point – the music in this game is classic Nintendo 8 bit ditties, that alas doesn’t get played as much as it should. The temple and town themes are great Zelda tunes, that alas do not get as much remixing nor playing as the other Nintendo gems. But try the Temple theme, classic Nintendo stuff! I work at a video game camp and THIS is the game we use to introduce kids to the concepts of game design. It is a simple but effective way to teach kids about the basics of an RPG and side scrolling game. I adore this game and want kids who are growing up with 3D games to understand the history of game design and the importance of a good story.